today in the first round at Flushing Meadows. NEW YORK -- Serena Williams had a short night at the U.S. Open. Kei Nishkori had a short stay. The top-ranked Williams, bidding for the first calendar-year Grand Slam since 1988, led Vitalia Diatchenko 6-0, 2-0 when the 25-year-old Russian retired with an ankle injury in the first of tonight's two matches at Arthur Ashe Stadium. Williams won 32 of the 37 points in the 27-minute match. Diatchenko, ranked 86th, had her left foot and ankle taped in the first set. Next for Williams on Wednesday is qualifier Kiki Bertens of the Netherlands. During the hot, humid day session, the fourth-seeded Nishikori fell to Benoit Paire of France 6-4, 3-6, 4-6, 7-6 (6), 6-4 at Louis Armstrong Stadium. Nishikori, last year's runner-up to Marin Cilic, squandered two match points in the fourth set. Meanwhile, top-seeded Novak Djokovic, seeking his second U.S. Open title but first since 2011, crushed Joao Souza of Brazil 6-1, 6-1, 6-1. Six women's seeds lost, including three in the top 10: No. 7 Ana Ivanovic of Serbia, No. 8 Karolina Pliskova of the Czech Republic and No. 10 Carla Suarez Navarro of Spain. Ivanovic fell 6-3, 3-6, 6-3 to Dominika Cibulkova, who avenged an opening-round loss to 15-year-old CiCi Bellis of Atherton in the San Francisco Bay Area in last year's U.S. Open. Also losing today was No. 30 Svetlana Kuznetsova, the 2004 U.S. Open champion from Russia, 6-3, 7-5 to Kristina Mladenovic of France. Another former U.S. Open champ from Russia, third-seeded Maria Sharapova, withdrew on Sunday with a right leg muscle strain that has sidelined her since Wimbledon. The highest remaining seed other than Williams in her half of the draw is No. 12 Belinda Bencic of Switzerland. They could meet in the quarterfinals. Bencic, 18, handed Williams her second loss of the year en route to the Toronto title two weeks ago. Men's seeded winners -- No. 1 Novak Djokovic, No. 7 David Ferrer, No. 8 Rafael Nadal, No. 9 Cilic, No. 10 Milos Raonic, No. 14 David Goffin, No. 17 Grigor Dimitrov, No. 18 Feliciano Lopez, No. 19 Jo-Wilfried Tsonga, No. 23 Roberto Bautista-Agut, No. 25 Andreas Seppi, No. 26 Tommy Robredo, No. 27 Jeremy Chardy, No. 32 Fabio Fognini. Men's seeded losers -- No. 4 Nishikori, No. 16 Gael Monfils. Women's seeded winners -- No. 1 Serena Williams (three-time defending champion), No. 12 Bencic, No. 13 Ekaterina Makarova, No. 15 Agnieszka Radwanska, No. 17 Elina Svitolina, No. 19 Madison Keys, No. 23 Venus Williams, No. 25 Eugenie Bouchard, No. 31 Anastasia Pavlyuchenkova. Women's seeded losers -- No. 7 Ivanovic, No. 8 Pliskova, No. 10 Suarez Navarro, No. 21 Jelena Jankovic, No. 29 Sloane Stephens, No. 30 Kuznetsova. Stars and stripes -- U.S. women went 10-5, including two all-American matches. Anna Tatishvili, a native of Georgia in Asia who became a U.S. citizen last year, whipped Pliskova 6-2, 6-1. The 6-foot-1 (1.86-meter) Pliskova, 23, has never advanced past the third round in a Grand Slam tournament. U.S. men went 1-4. The only victory came from 33-year-old Mardy Fish, who will retire after the tournament. The former world No. 7 has battled an irregular heartbeat and severe anxiety for the past three years. Fast fact -- Nishikori became the first U.S. Open men's finalist from the previous year to lose in the first round since 1999. Northern California connection -- Pliskova reached the final of the Bank of the West Classic at Stanford this month, losing to Angelique Kerber of Germany but cracking the top 10 for the first time. Australia's John Millman, who won the Aptos Challenger three weeks ago, lost to Sergiy Stakhovsky of Ukraine 6-1, 3-6, 7-6 (3), 6-4. Stakhovsky stunned Roger Federer in the second round at Wimbledon two years ago, ending the Swiss' streak of Grand Slam quarterfinals at 36. Tuesday at Arthur Ashe Stadium -- Day session (beginning at 8 a.m. PDT, streaming on ESPN3 from 8 to 10 a.m., then shown on ESPN): Simona Halep (2) vs. Marina Erakovic, Caroline Wozniacki (4) vs. Jamie Loeb, Roger Federer vs. Leonardo Mayer. Night session (beginning at 4 p.m. PDT, ESPN): Andy Murray (3) vs. Nick Kyrgios, Petra Kvitova (5) vs.Laura Siegemund. Serena Williams (1) -- Seeks fourth straight U.S. Open title and record seventh overall, first calendar-year Grand Slam since Steffi Graf in 1988 and 22nd major singles titles (tying Graf for second on all-time list behind Margaret Court's 24). NorCal connection: Three-time Bank of the West Classic champion at Stanford (2011, 2012, 2014). Simona Halep (2) -- Last year's French Open runner-up has never reached U.S. Open quarterfinals in five attempts. NorCal connection: Lost in first round of 2011 Bank of the West Classic in only appearance at Stanford. Maria Sharapova (3) -- U.S. Open champion in 2006 has been sidelined since Wimbledon with muscle strain in right leg. NorCal connection: Runner-up to Victoria Azarenka in 2010 Bank of the West Classic. Caroline Wozniacki (4) -- Two-time U.S. Open runner-up (2009, 2014) and former world No. 1 hasn't beaten top-35 player on this summer's hardcourt circuit. NorCal connection: In Bank of the West Classic debut this month, lost to No. 60 Varvara Lepchenko in second round after receiving bye. Petra Kvitova (5) -- Two-time Wimbledon champion (2011, 2014), who has never reached U.S. Open quarterfinals in seven attempts, has been suffering from mononucleosis but won third New Haven title on Saturday. NorCal connection: None. Garbine Muguruza (9) -- This year's Wimbledon runner-up withdrew from Stanford with abdominal strain, then lost early in Toronto and Cincinnati. NorCal connection: Won doubles title in 2014 Bank of the West Classic with fellow Spaniard Carla Suarez Navarro. Belinda Bencic (12) -- Eighteen-year-old Swiss handed Williams second loss of year en route to Toronto title two weeks ago. NorCal connection: None. Victoria Azarenka (20) -- Two-time Australian Open champion and former world No. 1 gradually rebounding from foot and knee injuries last year. NorCal connection: Won Bank of the West Classic in 2010. Williams will overcome her biggest obstacle, pressure, and earn a calendar-year Grand Slam. his first U.S. Open title in four years. Novak Djokovic (1) -- Hasn't won U.S. Open since 2011; 1-4 in finals at Flushing Meadows. Northern California connection: None. Roger Federer (2) -- Five-time U.S. Open champion (2004-08) turned 34 this month. NorCal connection: None. Andy Murray (3) -- U.S. Open champion in 2012 beat Djokovic two weeks ago in Montreal final. NorCal connection: Went 10-0 in now-defunct SAP Open in San Jose, winning title in 2006 at 18 years old and in 2007. Also won Aptos Challenger in 2005. Kei Nishikori (4) -- U.S. Open runner-up last year withdrew from Cincinnati last week with hip injury. NorCal connection: Played in SAP Open three times, losing in second round in 2008, 2009, 2011. Brad Gilbert of San Rafael coached Nishikori in 2011. Stan Wawrinka (5) -- Added this year's French Open title to 2014 Australian Open crown. NorCal connection: None. Tomas Berdych (6) -- Wimbledon runner-up in 2010 lost to qualifiers in Montreal (Donald Young in second round) and Cincinnati (Alexandr Dolgopolov in quarterfinals) this month. NorCal connection: Reached quarterfinals of 2009 SAP Open as fifth seed in only San Jose appearance. Rafael Nadal (8) -- Two-time U.S. Open champion (2010, 2013) has slumped after missing three months last summer with right wrist injury and undergoing appendectomy in November. NorCal connection: None. Marin Cilic (9) -- U.S. Open defending champion played only one tournament in first three months of year because of right (serving) shoulder injury. NorCal connection: None. Sorry, folks. I'm going to keep riding the Williams-Djokovic train until it goes off the tracks. Djokovic has a favorable draw given Nadal's loss of confidence and Cilic's struggles, but Murray and possibly Federer loom as big threats. First round, 8-10 a.m., ESPN3 (streamed live). First round, 10 a.m.-3 p.m., ESPN (live). First round, 3-8 p.m., ESPN2 (live). First round, 10 a.m.-8 p.m., ESPN (live). Second round, 8-10 a.m., ESPN3 (streamed live). Second round, 10 a.m.-3 p.m., ESPN (live). Second round, 3-8 p.m., ESPN2 (live). Second round, 10 a.m.-2 p.m., ESPN (live). Second round, 2-8 p.m., ESPN2 (live). Third round, 8-10 a.m., ESPN3 (streamed live). Third round, 10 a.m.-3 p.m., ESPN (live). Third round, 3-8 p.m., ESPN2 (live). Third round, 8 a.m.-8 p.m., ESPN2 (live). Fourth round, 8 a.m.-8 p.m., ESPN2 (live). Quarterfinals, 9 a.m.-8 p.m., ESPN (live). Quarterfinals, 8 a.m.-3 p.m., ESPN (live). Men's quarterfinal, 5-8 p.m., ESPN2 (live). Women's semifinals, 4-8 p.m., ESPN (live). Mixed doubles final, 9-11 a.m., ESPN3 (streamed live). Men's semifinals, noon-8 p.m., ESPN (live). Men's doubles final, 9-11 a.m., ESPN3 (streamed live). Women's final, noon-3 p.m., ESPN (live). Women's doubles final, 9-11 a.m., ESPN3 (streamed live). Men's final, 1-4 p.m., ESPN (live). CiCi Bellis, who pulled off a monumental upset in the 2014 U.S. Open, will not play in the main draw at Flushing Meadows this year. Bellis, 16, of Atherton in the San Francisco Bay Area lost to 11th-seeded Jelena Ostapenko, 18, of Latvia 6-3, 6-2 on Friday in the final round of qualifying. Ostapenko won the Wimbledon girls singles title last year. In the 2014 U.S. Open, Bellis became the youngest player to win a main-draw singles match since Anna Kournikova, also 15, in 1996. And Bellis didn't beat just anybody. She beat a seed. And not just any seed. She stunned 12th-seeded Dominika Cibulkova, last year's Australian Open runner-up to Li Na. Meanwhile, two former Sacramento Challenger finalists, Mayo Hibi and wild card Jessica Pegula, advanced to the main draw of the U.S. Open. Mayo Hibi, the 2013 Sacramento champion at 17, defeated former top-25 player Sorana Cirstea of Romania 6-4, 6-4. Hibi plays for her native Japan but has lived in California since she was 2 1/2. She will face 16th-seeded Sara Errani of Italy on Monday or Tuesday in the first round. Errani reached the final of the 2012 French Open, losing to Maria Sharapova. Pegula, the runner-up to Maria Sanchez in the inaugural Sacramento Challenger in 2012, beat 2009 U.S. Open quarterfinalist Melanie Oudin 7-6 (8), 6-0 in a matchup of Americans. Pegula's billionaire father, Terry, owns the NFL's Buffalo Bills and the NHL's Buffalo Sabres. Both Hibi and Pegula will play singles in the main draw of a Grand Slam tournament for the first time. In doubles at the U.S. Open, Pegula reached the third round in 2011 at 17 with Taylor Townsend, then 15, and the second round in 2012 with Madison Keys, then 17. Two other U.S. women, 16th-seeded Anna Tatishvili and Shelby Rogers, and one American man, 18-year-old Tommy Paul, survived qualifying. In June, Paul joined John McEnroe (1977) and Bjorn Fratangelo (2011) as the only U.S. boys to win the French Open junior title in the Open era (since 1968). U.S. Open National Playoffs in New Haven, Conn. -- Top-seeded Julio Peralta of Chile and Matt Seeberger, a San Francisco native living in Vancouver, British Columbia, won the title to earn a wild card in the main draw of men's doubles at the U.S. Open. Peralta, 33, and Seeberger, 31, will make their Grand Slam debuts after defeating Australians Ashley Fisher and Nathan Healey 6-4, 6-3. 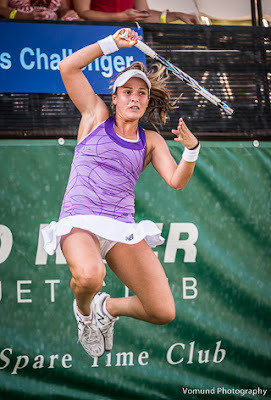 Seeberger joined the pro circuit as a doubles specialist only last year. He won a record eight NCAA titles (three singles, three doubles and two team) at Division III UC Santa Cruz from 2004 to 2007. In Friday's women's final, Sacramento-area residents Yasmin Schnack and Katsiaryna Zheltova lost to University of Alabama stars Maya Jansen and Erin Routliffe 6-4, 7-5. Jansen and Routliffe, the two-time reigning NCAA Division I doubles champions, will receive a wild card in the main draw of women's doubles at Flushing Meadows. second round of the U.S. Open. Nicole Gibbs collected $103,442 for reaching the third round of last year's U.S. Open as a wild card. The former Stanford star will be hard-pressed to repeat that performance this year. The men's and women's singles draws for the U.S. Open were conducted on Thursday at the USTA Billie Jean King National Tennis Center in Flushing Meadows, N.Y. The year's last Grand Slam tournament begins Monday. Gibbs, 22, likely will beat Lourdes Dominguez Lino, a 34-year-old Spaniard, in the first round. Gibbs is 1-0 against Dominguez Lino, having cruised 6-3, 6-3 in the second round of qualifying at New Haven, Conn., in 2012. Looming in the second round of the U.S. Open, however, is fifth-seeded Petra Kvitova, a two-time Wimbledon champion who drew a qualifier in the first round. Granted, the U.S. Open is Kvitova's worst Grand Slam tournament, and she revealed on Aug. 10 that she has been suffering from mononucleosis. But the 25-year-old left-hander defeated top-20 players Madison Keys and Agnieszka Radwanska back-to-back to reach today's semifinals at New Haven. It could be worse for Gibbs. She could have Jarmila Gajdosova's draw. Gajdosova, who starred for the Sacramento-based California Dream of World TeamTennis in July, will face 26th-seeded Flavia Pennetta of Italy in the first round. Pennetta, 33, leads the head-to-head series 2-1, but Gajdosova won the last meeting 6-1, 6-4 in the first round at Wuhan, China, last fall. Gajdosova, ranked 75th to Pennetta's 26th, won't exactly enter the U.S. Open match full of confidence. She is 1-3 on the summer hardcourt circuit with no main-draw wins. On the men's side, San Francisco native Sam Querrey has a good chance to reach the third round, in which he could face sixth-seeded Tomas Berdych of the Czech Republic. Querrey, ranked No. 38, will play No. 64 Nicolas Mahut of France for the first time in the opening round. Querrey, 27, has reached two finals this year, losing to countryman Jack Sock on clay in Houston in April and to Denis Istomin of Uzbekistan on grass in Nottingham in June. Mahut, 33, won the title on grass at s-Hertogenbosch, Netherlands, in June as a qualifier. He is best known for losing to John Isner 70-68 in the fifth set in the first round at Wimbledon in 2010 in the longest match in tennis history (11 hours, 5 minutes over three days). The winner of the Querrey-Mahut match could play 31st-seeded Guillermo Garcia-Lopez of Spain in the second round. It would be the second straight year Querrey and Garcia-Lopez have met at that stage of the U.S. Open. Querrey won 6-3, 6-4, 6-4 in 2014 before losing to top-ranked Novak Djokovic 6-3, 6-2, 6-2.
at Stanford, reached the final round of qualifying for the U.S. Open. San Francisco Bay Area residents CiCi Bellis and Dennis Novikov faced seeds today in the second round of qualifying for the U.S. Open in Flushing Meadows, N.Y.
Only the 16-year-old Bellis survived. Bellis, who lives in Atherton, upset 22nd-seeded Romina Oprandi of Switzerland 7-5, 7-5. Novikov, 21, of Milpitas, lost to 26th-seeded Matthew Ebden of Australia 6-3, 6-7 (3), 6-2. "Unfortunately couldn't pull it out today," Novikov tweeted. "Live and you learn." Bellis will play 11th-seeded Jelena Ostapenko, 18, of Latvia on Friday for a berth in the main draw, which begins Monday. Ostapenko, who won the 2014 Wimbledon girls singles title, outlasted Julia Glushko of Israel 2-6, 6-0, 6-4. Bellis received a wild card in last year's U.S. Open and shocked 12th-seeded Dominika Cibulkova, the 2014 Australian Open runner-up, in the first round. Bellis became the youngest player to win a match at Flushing Meadows since Anna Kournikova, also 15, in 1996. U.S. Open National Playoffs in New Haven, Conn. -- Sacramento-area residents Yasmin Schnack and Katsiaryna Zheltova demolished Americans Josephine Cao and Dilara Spicer 6-1, 6-0 to reach the doubles final. Schnack and Zheltova will meet University of Alabama stars Maya Jansen and Erin Routliffe on Friday for a wild card in the main draw of women's doubles in the U.S. Open. Jansen and Routliffe, who have won the last two NCAA doubles titles, outclassed Americans Alexandra Anghelescu and Caroline Price 6-2, 6-2. Schnack retired from the pro tour in 2012 at age 24 after winning 11 doubles titles on the ITF women's circuit and reaching a career-high No. 140 in women's doubles. Zheltova, a Belarus native, earned All-America honors at Sacramento State in 2008 by reaching the Sweet 16 in singles at the NCAA Championships. Also that year, Schnack helped UCLA win the team title. In the men's doubles semifinals of the U.S. Open National Playoffs, top-seeded Julio Peralta of Chile and Matt Seeberger of Vancouver, British Columbia, edged Americans Vahid Mirzadeh and Jesse Witten 7-6 (6), 7-6 (4). Peralta and Seeberger will face Ashley Fisher and Nathan Healey in Friday's final. The Australian pair defeated Daniel Cochrane of Great Britain and Phillip Simmonds of the United States 6-4, 6-3. Seeberger was born in San Francisco and won a record eight NCAA titles (three singles, three doubles and two team) at Division III UC Santa Cruz. The champions will earn a wild card in the main draw of men's doubles in the U.S. Open. Ipek Soylu, 19, of Turkey beat Modesto product Maria Sanchez 5-7, 7-5, 6-1 today in the first round of qualifying for the U.S. Open in Flushing Meadows, N.Y.
Sanchez, a 25-year-old USC graduate, made her fourth appearance in the U.S. Open main draw or qualifying. She lost to Daniela Hantuchova in the opening round of the main draw in 2013 and fell in the final round of qualifying in 2012 and 2014. Sanchez has played in the doubles main draw at Flushing Meadows for the past three years. She reached the second round in 2012 with Irina Falconi and lost in the first round with Shelby Rogers in 2013 and ex-Stanford star Nicole Gibbs last year. Sanchez is ranked No. 172 in singles and No. 89 in doubles. She won the doubles title in the $100,000 Vancouver Challenger for the second straight year last week, this time with Johanna Konta of Great Britain. Soylu won last year's U.S. Open girls doubles title with Jil Teichmann of Switzerland. U.S. Open National Playoffs in New Haven, Conn. -- Sacramento-area residents Yasmin Schnack and Katsiaryna Zheltova moved into the semifinals with a 6-3, 6-1 victory over Americans Rima Asatrian and Katharine Fahey. Schnack, who has won 11 doubles titles on the ITF women's circuit, and Zheltova, a former Sacramento State All-American from Belarus, will meet Josephine Cao and Dilara Spicer. They outclassed fellow Americans Brittany Collens and Michelle Fuca 6-1, 6-3. Advancing to the men's semifinals were top-seeded Matt Seeberger of Vancouver, British Columbia, and Julio Peralta of Chile. They defeated Ace Matias of the United States and Denys Pume of Ukraine 6-4, 6-4. Seeberger, 31, was born in San Francisco and starred at UC Santa Cruz. The men's and women's champions will receive wild cards into the main draws of the U.S. Open. San Francisco Bay Area residents CiCi Bellis and Dennis Novikov won in eerily similar fashion today in the first round of qualifying for the U.S. Open. Both lost the first set. Both trailed by an early break in the third set. Both battled back for 4-4, and both prevailed 6-4 in the third set within minutes of each other in Flushing Meadows, N.Y.
Bellis, 16, of Atherton outlasted 44-year-old Kimiko Date-Krumm of Japan 4-6, 6-1, 6-4. Novikov, a 21-year-old Milpitas resident, topped Gastao Elias of Portugal 6-7 (3), 6-3, 6-4. Date-Krumm reached a career-high No. 4 in the world in 1995, four years before Bellis was born, and retired in 1996 for 11 1/2 years. Bellis initially struggled with Date-Krumm's flat groundstrokes. “I was scrambling in the first set," Bellis said. "She hits the ball so low, and it barely goes over the net, so you literally have to be on the ground to hit it back. Bellis received a wild card in last year's U.S. Open by winning the USTA Girls 18 National Championships in San Diego. She stunned No. 12 seed and 2014 Australian Open runner-up Dominika Cibulkova in the first round at Flushing Meadows before losing to Kazakhstan's Zarina Diyas, now ranked 34th, in three sets. Bellis avenged the loss by whipping Diyas 6-2, 6-1 in the second round at Miami in March. Diyas was seeded 29th in the prestigious tournament. Novikov competed in the Aptos Challenger two weeks ago. Novikov, ranked No. 204, has a booming serve at 6-foot-4 (1.93 meters) and 200 pounds (91 kilograms). “I thought I played pretty well overall,” said Novikov, who will face No. 26 seed Matthew Ebden of Australia on Thursday in the next round. “A very close match and a couple points decided it, but I thought I was a little more consistent than he was today. I knew I had a couple chances (in the tiebreak) when I was serving for the first set, so I just kept playing and I took my opportunities. Amazingly, Novikov reached the second round in each event at Flushing Meadows. He shocked 86th-ranked Jerzy Janowicz, a 6-foot-8 (2.03-meter) Pole and 2013 Wimbledon semifinalist, in singles and teamed with Michael Redlicki to knock off U.S. veterans Bobby Reynolds and Michael Russell in doubles. U.S. Open National Playoffs in New Haven, Conn. -- Sacramento-area residents Yasmin Schnack and Katsiaryna Zheltova upset top-seeded Jacqueline Cako and Keri Wong, both of the United States, 6-1, 2-6 [10-8] in the first round. Schnack, who helped UCLA win the 2008 NCAA title, and Zheltova, a former Sacramento State All-American from Belarus, will play Rima Asatrian of Tenafly, N.J., and Katharine Fahey of Fair Haven, N.J., in the quarterfinals. Asatrian, a sophomore at Columbia University in New York, and Fahey edged Ketevan Okruashvili and Magda Okruashvili of Georgia 4-6, 6-1 [10-8]. In the first round of men's doubles, top-seeded Julio Peralta of Chile and Matt Seeberger of Vancouver, British Columbia, defeated Jordan Kerr of Australia and Travis Parrott of the United States 6-3, 7-6 (4). Seeberger, 31, was born in San Francisco and starred at UC Santa Cruz. Parrott won the 2009 U.S. Open mixed doubles title with fellow American Carly Gullikson. UC Davis senior Brett Bacharach and Aggies assistant coach Michael Meyer lost to Ace Matias of the United States and Denys Pume of Ukraine 2-6, 7-6 (3) [11-9]. San Francisco native Sam Querrey narrowly missed being seeded for the U.S. Open. Italy's Fabio Fognini, ranked No. 32 in the world, received the 32nd and last seeding in the year's final Grand Slam tournament. The 38th-ranked Querrey could face a high seed early in the U.S. Open, which begins Monday in Flushing Meadows, N.Y. The seeds, announced today, were based on Monday's ATP World Tour and WTA rankings. Querrey, 27, has reached the fourth round of the U.S. Open twice (2008 and 2010) to equal his best Grand Slam result. The 6-foot-6 (1.98-meter) veteran advanced to the third round last year, losing to top-seeded Novak Djokovic 6-3, 6-2, 6-2. Shortly after Querrey was born, he moved with his family to Santa Rosa, near San Francisco. He then relocated to Las Vegas at age 7 and to Thousand Oaks in the Los Angeles area at 10. Querrey, whose father is a mortgage banker, turned pro in 2006 after graduating from Thousand Oaks High School. He lives in Las Vegas; Nevada, unlike California, has no state income tax. Three-time defending champion Serena Williams and Djokovic, the 2011 winner and four-time runner-up, received the top seedings for the U.S. Open. It's the first time that the same man and woman have been seeded first for three straight years since Ivan Lendl and Steffi Graf from 1987 through 1989. Williams will try to complete a calendar-year Grand Slam, last accomplished by Graf in 1988. Williams also can tie Graf with 22 major singles titles, second all-time behind Margaret Court's 24, and win her seventh U.S. Open singles crown. That would break the Open-era (since 1968) record she shares with Chris Evert. Czech Karolina Pliskova, the runner-up to Angelique Kerber of Germany in the Bank of the West Classic at Stanford three weeks ago, is seeded eighth. Kerber is 11th. No. 2 Roger Federer is seeded at the U.S. Open for the 15th straight year, suprassing Lendl for the second-longest streak in the Open era behind Jimmy Connors at 18. The United States has four women's seeds (Serena Williams, No. 19 Madison Keys, No. 23 Venus Williams and No. 29 Sloane Stephens) and two men's seeds (No. 13 John Isner and No. 28 Jack Sock). Venus Williams won the U.S. Open in 2000 and 2001. The singles draws will be held on Thursday at 8:30 a.m. California time (live streaming at usopen.org). Collin Altamirano, 19-year-old Sacramentan -- No. 799 in singles (-5), 950 in doubles (-7). Bradley Klahn, 25-year-old former Stanford star -- No. 149 in doubles (-3), No. 280 in singles (-13). Scott Lipsky, 34-year-old former Stanford star -- No. 36 in doubles (-1). Mackenzie McDonald, 20-year-old Piedmont resident -- No. 820 in singles (-6), No. 723 in doubles (no change). Dennis Novikov, 21-year-old San Jose resident -- No. 204 in singles (-3), No. 184 in doubles (-2). Sam Querrey, 27-year-old San Francisco native -- No. 38 in singles (-4), No. 81 in doubles (+9). Tennys Sandgren, 24-year-old member of Sacramento-based California Dream in World TeamTennis -- No. 257 in singles (-3), No. 224 in doubles (-1). Matt Seeberger, 31-year-old Los Altos resident -- No. 158 in doubles (-2). Neal Skupski, 25-year-old member of California Dream -- No. 111 in doubles (+2). Kristie Ahn, 23-year-old former Stanford star -- No. 311 in singles (no change), No. 894 in doubles (-4). CiCi Bellis, 16-year-old resident of Atherton in San Francisco Bay Area -- No. 161 in singles (-2). Alexandra Facey, 22-year-old resident of Cameron Park in Sacramento area -- Career-high No. 630 in doubles (+13). Kat Facey, 22-year-old resident of Cameron Park in Sacramento area -- Career-high No. 630 in doubles (+13). Jarmila Gajdosova, 28-year-old member of California Dream (2015) -- No. 75 in singles (no change), No. 72 in doubles (+1). Anabel Medina Garrigues, 33-year-old member of California Dream (2015) -- No. 31 (no change) in doubles. Nicole Gibbs, 22-year-old former Stanford star -- No. 117 in singles (no change). Michaela Gordon, 16-year-old resident of Saratoga in San Francisco Bay Area -- No. 625 in singles (-4). Raquel Kops-Jones, 32-year-old San Jose resident and former Cal star -- No. 17 in doubles (-2). Maegan Manasse, 20-year-old Cal junior -- Career-high No. 498 in doubles (+4), career-high No. 832 in singles (+15). Maria Sanchez, 25-year-old Modesto product -- No. 89 in doubles (+7), No. 172 in singles (+1). Carol Zhao, 20-year-old Stanford junior -- Career-high No. 193 in doubles (+28), No. 374 in singles (-1). New Haven (women), semifinals, 10 a.m.-noon (live). Winston-Salem (men), semifinals, noon-2 p.m. (live). New Haven (women), semifinals, 4-6 p.m. (live). Winston-Salem (men), final, 10 a.m.-noon, ESPN2 (live). New Haven (women), final, noon-2 p.m. (live). was given a suspended fine and ban for aggravated behavior. Nick Kyrgios committed the major offense of aggravated behavior in his second-round match against Stan Wawrinka at the Rogers Cup in Montreal on Aug. 12, the ATP announced Monday. The ATP imposed a further fine of $25,000 and a 28-day suspension. However, the penalties will be withheld if Kyrgios does not incur any fines for verbal or physical abuse or accumulate fines totaling more than $5,000 for any other offenses over the next six months. Kyrgios, therefore, can play in the U.S. Open, which begins Monday. A courtside microphone picked up Kyrgios, 20, saying that fellow Australian Thanasi Kokkinakis had slept with Wawrinka's girlfriend, reportedly 19-year-old Croatian player Donna Vekic. Kyrgios later apologized on his Facebook page. Kyrgios was fined the on-site maximum of $10,000. He also was assessed $2,500 for unsportsmanlike conduct related to a comment made to a ball person during the match. the first round of the main draw at last year's U.S. Open. It'll be the kid versus Kimiko today in the first round of U.S. Open qualifying. CiCi Bellis, 16, of Atherton in the San Francisco Bay Area will face 44-year-old Kimiko Date-Krumm of Japan at the USTA Billie Jean King National Tennis Center in Flushing Meadows, N.Y.
Bellis did not receive another wild card after stunning 12th-seeded Dominika Cibulkova in the first round of the main draw at last year's U.S. Open. Bellis became the youngest player to win a main-draw match at the U.S. Open since Anna Kournikova, also 15, in 1996. Date-Krumm reached the U.S. Open quarterfinals in 1993 and 1994, and climbed to a career-high No. 4 in the world in 1995. She retired at the end of 1996 for 11 1/2 years. Date-Krumm is ranked No. 148, and Bellis is No. 161. Maria Sanchez, a 25-year-old Modesto product, is scheduled to play 19-year-old Ipek Soylu of Turkey in the first round of qualifying on Wednesday. Sanchez, a 2011 USC graduate, is ranked No. 172. That's nine spots ahead of Soylu, who won last year's U.S. Open girls doubles title with Jil Teichmann of Switzerland. On the men's side, 21-year-old Dennis Novikov of Milpitas in the Bay Area will take on Gastao Elias, 24, of Portugal today. Elias is ranked No. 186 to Novikov's No. 204. Qualifying continues through Friday, and the main draw begins on Monday. Modesto product Maria Sanchez claimed her second straight Vancouver Challenger doubles title on Saturday. The unseeded team of Sanchez and Johanna Konta of Great Britain beat fourth-seeded Raluca Olaru of Romania and Anna Tatishvili of the United States 7-6 (5), 6-4 in the final of the $100,000 Odlum Brown VanOpen. The 25-year-old Sanchez has won four doubles titles this year (two with Konta) and 14 in her career, including one on the elite WTA tour with Sharon Fichman of Canada. Sanchez triumphed in Vancouver last year with countrywoman Asia Muhammad. Konta, seeded seventh in singles, will try for a sweep today when she faces top-seeded Kirsten Flipkens of Belgium in the final. Flipkens reached the Wimbledon semifinals in 2013. Sanchez and Konta split $6,200. Collin Altamirano, 19-year-old Sacramentan -- No. 794 in singles (+116), 943 in doubles (-6). Bradley Klahn, 25-year-old former Stanford star -- No. 146 in doubles (+1), No. 267 in singles (-4). Scott Lipsky, 34-year-old former Stanford star -- No. 35 in doubles (+1). Mackenzie McDonald, 20-year-old Piedmont resident -- No. 814 in singles (+2), No. 723 in doubles (+2). Dennis Novikov, 21-year-old San Jose resident -- No. 201 in singles (+1), career-high No. 182 in doubles (+4). Sam Querrey, 27-year-old San Francisco native -- No. 34 in singles (-2), No. 90 in doubles (-24). Tennys Sandgren, 24-year-old member of Sacramento-based California Dream in World TeamTennis -- No. 223 in doubles (-5), No. 254 in singles (+4). Matt Seeberger, 31-year-old Los Altos resident -- No. 156 in doubles (+3). Neal Skupski, 25-year-old member of California Dream -- No. 113 in doubles (-4). Kristie Ahn, 23-year-old former Stanford star -- No. 311 in singles (+1), No. 890 in doubles (+6). CiCi Bellis, 16-year-old resident of Atherton in San Francisco Bay Area -- No. 159 in singles (-1). Alexandra Facey, 22-year-old resident of Cameron Park in Sacramento area -- No. 643 in doubles (+3). Kat Facey, 22-year-old resident of Cameron Park in Sacramento area -- No. 643 in doubles (+3). Jarmila Gajdosova, 28-year-old member of California Dream (2015) -- No. 75 in singles (+1), No. 73 in doubles (no change). Nicole Gibbs, 22-year-old former Stanford star -- No. 117 in singles (-7). Michaela Gordon, 16-year-old resident of Saratoga in San Francisco Bay Area -- No. 621 in singles (+2). Raquel Kops-Jones, 32-year-old San Jose resident and former Cal star -- No. 15 in doubles (-5). Maegan Manasse, 20-year-old Cal junior -- Career-high No. 502 in doubles (+55), No. 847 in singles (-1). Maria Sanchez, 25-year-old Modesto product -- No. 96 in doubles (no change), No. 173 in singles (-1). Carol Zhao, 20-year-old Stanford junior -- Career-high No. 221 in doubles (+218), No. 373 in singles (+1). Cincinnati, men's doubles final, 8-10 a.m. (Tennis Channel). Cincinnati, men's singles final, 10 a.m.-noon (live), ESPN2. Cincinnati, women's singles final, noon-2 p.m. (live), ESPN2. insulting Stan Wawrinka last week. Australia has built a sterling tennis reputation, symbolized by gentlemanly legend Rod Laver, over the past century. Nick Kyrgios and Bernard Tomic, though, have tarnished that image with their recent antics. "I'd like to say they haven't, but I'd probably be lying seeing as how it's all over the news worldwide," Australian veteran Matthew Ebden said Sunday at the $100,000 Comerica Bank Challenger in Aptos, where he reached the singles quarterfinals and doubles final. "I've seen a bunch of comments -- people in Australia and around the world are not happy. "I don't think the reaction is good at all. I think even Novak (Djokovic) and Rafa (Nadal), some of our coaches and (Tennis Australia performance director Patrick) Rafter have had a go with both of them a lot." Added Australian John Millman, who became the first No. 1 seed in the 28-year history of the Aptos Challenger to win the singles title: "Australia does have a proud history in tennis, and we've got some great role models to look up to. I don't wish to make excuses on anyone. We can all strive to be better. "Nick and Bernie are both extremely young guys. They will learn, they're going to get older, and they're going to have experiences. It probably won't be the last time controversy strikes, but hopefully they keep maturing into people that (others) can look up to." The ATP fined the 20-year-old Kyrgios $10,000 for insulting Stan Wawrinka during their second-round match in Montreal last week. A courtside microphone picked up Kyrgios saying that fellow Aussie Thanasi Kokkinakis had slept with Donna Vekic, a 19-year-old Croatian player who reportedly is Wawrinka's girlfriend. Kyrgios later apologized on his Facebook page. "In this day and age with social media and all the microphones on the court," said the 26-year-old Millman, who has impeccable character, "you have to be really careful with the things you're saying out there. It's probably not the best to get personal. "Being an Australian, it's tough to chastise (Kyrgios). He has Lleyton Hewitt working with him now. Lleyton was involved in a little bit of controversy early on, but what a role model (Kyrgios) has to work with." In the second round of the 2001 U.S. Open, Hewitt implied to Swiss umpire Andreas Egli that a black linesman was biased toward opponent James Blake. Hewitt, then 20, went on to win the title and become the youngest player to rank No. 1 in the world. He had other less-publicized run-ins with officials and fans early in his career. Now 34, Hewitt plans to retire after his 20th Australian Open in January. Kyrgios, a semifinalist in the 2013 Sacramento Challenger, also was fined almost $10,000 last month at Wimbledon for swearing loudly and violently abusing his rackets. In addition, he was accused of tanking in his fourth-round loss to Richard Gasquet. "There have been quite a lot of incidents, obviously," conceded the 27-year-old Ebden, a stand-up guy. "I'm pretty friendly with Nick. I have no problem with him personally. We get on fine. He's young, there are pressures, there's stuff going on. "This time, I read some comments that some people said he crossed the line, and he probably did. He probably knows that himself, and that's why he apologized. It's going to be interesting for him to see how he can get through that. Hopefully, he can learn from it." Tomic, 22, was suspended from last month's Davis Cup quarterfinal against Kazakhstan in Darwin, Australia, for criticizing Rafter. During the competition, Tomic was charged with resisting arrest and trespassing in Miami Beach, Fla. That prompted Rafter to tell Australian media that Tomic had hit "rock bottom." In 2013, Tomic had his driver's license taken away for speeding on the Gold Coast near Brisbane, Australia. A year earlier, he was investigated after an alleged brawl in a Gold Coast apartment spa. Tomic's father and coach, John Tomic, received an eight-month suspended sentence and banned from the ATP World Tour for a year in September 2013 for assaulting Bernard's former hitting partner, Thomas Drouet. "Obviously, Bernie has been through a lot of things himself," said Ebden, and the 2013 Australian Open mixed doubles champion with Jarmila Gajdosova, a Slovakian-born Australian who played for the Sacrament-based California Dream in World TeamTennis last month. "I'm good friends with him. I tell him to his face (that) he's done some silly things. He's done some smart things, too. It's been a slow learning process for him." Ebden said the behavior of Kyrgios and Tomic "is definitely a bit of a problem, but with every problem, there's opportunity. It'll be interesting to see in the next year or two if they can mature. I'm sure they will. No one is stupid. They're not thick, totally stupid. Sooner or later they're going to mature as they get older and go through experiences. "It's not pretty. (Kyrgios) can't be enjoying all the stuff he's having to deal with. I know he likes the attention. He got a lot of attention for it -- they both did, but all the negativity that comes with it probably is not what they want. I'm sure they can find the right way to deal with it. We all have made mistakes. We all try to grow and mature and try to enjoy our tennis journey." The 6-foot-4 (1.93-meter) Kyrgios and the 6-foot-5 (1.96-meter) Tomic already have three Grand Slam quarterfinal appearances between them. Millman said of Kyrgios: "We've seen at the (2015) Australian Open and (last year at) Wimbledon where he's made the quarterfinals that he can really mix it with these best guys. Hopefully, he can let his racket do the talking." It gets chilly at night in Aptos, a California town on the Pacific Ocean. But fans who stayed for the first-round match between teenagers Yoshihoto Nishioka of Japan and Jared Donaldson of the United States last week in the $100,000 Comerica Bank Challenger were rewarded with perhaps the shot of the year on the Challenger tour. Late in the third set, Donaldson wrong-footed Nishioka with a forehand volley. Nishioka -- a 5-foot-7 (1.70-meter), 141-pound (64-kilogram) left-hander -- responded with a clean behind-the-back passing shot down the line. The 19-year-old Nishioka, seeded eighth, immediatedly flipped his racket to the court in disbelief, raised his arms triumphantly, turned to his camp and smiled widely. Even Donaldson, an 18-year-old wild card, applauded with one hand and his racket. Nishioka won 4-6, 6-3, 6-3 and went on to reach the quarterfinals, attaining a career-high ranking of No. 127. U.S. Open wild cards -- The list of U.S. Open wild cards, eight men and eight women, released Tuesday contains some surprises. Austin Krajicek received a wild card, but CiCi Bellis did not. The U.S. Open is scheduled for Aug. 31 through Sept. 13 in Flushing Meadows, N.Y.
Krajicek, a 25-year-old left-hander from Bradenton, Fla., fell short of winning the U.S. Open Wild Card Challenge by falling to John Millman of Australia in the final of the Comerica Bank Challenger. Bjorn Fratangelo won the Wild Card Challenge as the American with the best results in two of three summer Challengers -- $50,000 Binghamton, N.Y., $50,000 Lexington, Ky., and Aptos -- but the USTA also awarded a wild card to Krajicek. Joining Fratangelo and Krajicek will be Australia's Lleyton Hewitt; Americans Donaldson, Ryan Harrison, Ryan Shane and Frances Tiafoe; and France's Pierre-Hughes Herbert. Hewitt, 34, will make his 15th and final appearance in the U.S. Open. He won the title in 2001 and reached the final in 2004. Bellis, a resident of Atherton in the San Francisco Bay Area, made headlines in last year's U.S. Open. As a 15-year-old wild card, she stunned 12th-seeded Dominika Cibulkova of Slovakia in the first round to become the youngest player to win a main-draw match in the U.S. Open since Anna Kournikova, also 15, in 1996. Cibulkova was the runner-up to Li Na in last year's Australian Open. Bellis, ranked No. 159, must win three qualifying matches to return to the main draw of the U.S. Open. One women's wild card went to American Nicole Gibbs, who turned pro out of Stanford as a junior in 2013 after winning her second straight NCAA singles title. Gibbs reached the third round of last year's U.S. Open as a wild card. "Massive thank you to @usta for another @usopen opportunity. Humbled. Happy. Thankful. Excited. All words that come to mind," Gibbs tweeted. Also awarded wild cards this year were Americans Bethanie Mattek-Sands, Louisa Chirico, Samantha Crawford, Sofia Kenin, Jamie Loeb and Sachia Vickery, and France's Oceane Dodin. Crawford, 20, won the women's U.S. Open Wild Card Challenge, which consisted of $50,000 tournaments in Stockton, Sacramento and Lexington. She also captured the U.S. Open girls singles title in 2012. The USTA has awarded college scholarships to three Northern Californians. Savannah Fisher of Oakland and Yok Jing Kamerian Ma of Manteca received $8,000 educational scholarships, and Annie Banks of Manteca picked up $1,000 for textbooks. Fisher, a recent graduate of Saint Joseph Notre Dame High School, will attend the University of La Verne in the Los Angeles area. Ma, from Manteca High School, is headed to the University of California at Davis. And Banks, a Sierra High School grad, will enroll at Brigham Young University-Idaho in Rexburg. The USTA's charitable foundation awards college scholarships annually to high school seniors who have excelled academically, served the community and participated in organized tennis. The foundation awarded $373,000 to 53 high school students nationwide this spring. history of the Aptos Challenger to win the singles title. APTOS, Calif. -- There's nothing flashy about the player who made history in the $100,000 Comerica Bank Challenger on Sunday. John Millman, a 6-foot (1.83-meter) Australian, isn't going to blow anyone off the court with his serve or forehand. He doesn't wear a gaudy necklace, diamond earrings or a mohawk. He doesn't swear on the court, and he certainly doesn't insult his opponent with sexual remarks. In short, Millman is the opposite of his countryman Nick Kyrgios. Millman is all business on the court. He wears down opponents with consistency, fitness and mental toughness. Just ask seventh-seeded Austin Krajicek, who lost to No. 1 Millman 7-5, 2-6, 6-3 in the Comerica final at the Seascape Sports Club. Millman saved three break points while serving for the championship at 5-3 in the third set. "He's extremely solid," said Krajicek, a 25-year-old left-hander from Bradenton, Fla. "He makes a lot of balls. He can really control the court. He moves great. He serves well, too, so it was tough to get on offense on his service games. He doesn't give you many free points." Millman became the first No. 1 seed in the 28-year-history of the Aptos tournament, the longest-running Challenger in the United States, to win the title. "Obviously, it's a nice feeling because the history of this tournament is quite special, but it'll probably just help out whoever is the No. 1 seed next year because they won't have to listen to that every day," cracked Millman, 26. "What's more special is just looking at the honor board and the people who have won this tournament. It's pretty special to know my name will be up with those types of players -- Andy Murray; Chris Guccione, a good friend of mine who won the doubles today, and he's won the singles here, too; Patty Rafter ... "
It was the second straight title for Millman, who won the $50,000 Lexington (Ky.) Challenger two weeks ago. "I knew I was playing some pretty good tennis coming into the match, and I think winning in Kentucky helped," Millman said. "You have a title under your belt, so everything is kind of a plus. "I think as the match went on, I started to feel it a little bit. It's been a long couple of weeks, and even before that I didn't have much of a break. I came from Wimbledon, and then I had Davis Cup after that. It's just been a lot of tennis, a lot of hours on court, and I probably felt a little leggy out there today, but you're not going to feel perfect every day of the week. It's just a matter of trying to excel when you're not feeling 100 percent." Krajicek also tired in the 81-degree (27.2 Celsius) heat. In addition to playing singles, he reached the doubles semifinals. Millman did not play doubles. "I was still able to play at a good level late in the third and still had chances," Krajicek said, "but definitely late in the tournament playing singles and doubles, it makes it tough. I let him get on offense on way too many points, so I was running from side to side, which isn't ideal, but he came up with the goods at the end. I don't think fatigue was the reason I lost, but it didn't help." Both Millman, who pocketed $14,400, and Krajicek, who collected $8,480, achieved career-high rankings with their Comerica finishes. Millman jumped 14 places to No. 71 in the world. Krajicek rose 19 spots to No. 113. Millman is ranked high enough to play in the main draw of the U.S. Open for the first time, but Krajicek needed to win the Comerica final to earn a wild card into the year's final Grand Slam tournament. Instead, Bjorn Fratangelo won the U.S. Open Wild Card Challenge as the American with the best results in two of three Challengers this summer: $50,000 Binghamton (N.Y.) $50,000 Lexington (Ky.) and Aptos. The U.S. Open is scheduled for Aug. 31 to Sept. 13 in Flushing Meadows, N.Y.
Krajicek, who survived a match point in the first round against Dennis Novikov of Milpitas, expressed mixed feelings about falling one set short of the U.S. Open wild card. "It's not great, but it's cool," he said. "I had a good run, a good week. It's still a very positive week for me either way. I can take a lot of good things out of it. I'll play qualies in New York and try to battle through that." Millman knows all about battling. He had major shoulder surgery in July 2013 and missed nine months. Because of injuries, he no longer trains fanatically. "I remember I lost a match in Spain, and I served for 3 1/2 hours straight, which probably wasn't great for my shoulder," Millman said. "I used to do so much work on court, but my body probably doesn't allow that anymore. I still think I work hard, and when I feel like I need to touch up, I maybe spend a little bit longer on the court. "Learning from the likes of Lleyton Hewitt, I really saw at Davis Cup just how intense his sessions are, from the very first ball. It's something that I pride myself on, trying to maximize my time in terms of intensity." Serving as a practice partner on Australia's Davis Cup team, which rallied from a 2-0 deficit to beat Kazakhstan last month in Darwin, Australia, is only one of Millman's highlights this year. Playing in his hometown of Brisbane in January, he led Roger Federer by a set and a break before losing 4-6, 6-4, 6-3 in the second round. "I didn't play bad tennis after that (lead)," Millman said. "Fed played some really good tennis, and I guess that's why he's had the career that he's had. "I had a night match here (on Friday) with Taro Daniel, who has roots in Aptos. I was saying to (my coach, Mark Draper), 'The pressure's not the same as a night match against Federer.' You draw upon those experiences, and hopefully they'll help me for the rest of my life, not just on the tennis court but post-tennis, too." Millman also won a Grand Slam main-draw match for the first time at Wimbledon, stunning then-No. 19 Tommy Robredo of Spain as a qualifier before losing to 2006 Australian Open runner-up and 2014 Aptos champion Marcos Baghdatis 6-4 in the fifth set. Krajicek, a distant relative of 1996 Wimbledon champion Richard Krajicek, has had a strange year. As a qualifier, he reached his first quarterfinal on the ATP World Tour at Memphis in February, beating then-No. 25 Ivo Karlovic (6-foot-11 or 2.11 meters), and advanced to the second round in Miami in March. But he won only one match in 10 tournaments from April to July. The 2-hour Comerica final featured many grueling rallies as Millman and Krajicek traded powerful groundstrokes. The only break of the first set came in the last game. Serving at 30-30, Krajicek netted a forehand. Then on set point, he missed his first serve. Millman jumped on Krajicek's second delivery, slugging it deep for a winner and the set. After the players traded early breaks in the second set for 2-2, Krajicek won four straight games for the set. Millman, though, shrugged it off and bolted to a 3-0 lead (one break) in the third set. "I just had to regroup," Millman said. "I probably played a couple of sloppy points in the second set, and Austin played some pretty tough tennis and didn't make many errors. He was hitting a couple of really big forehands. "I was determined to win. I'm really glad with the way I started off the third set -- upbeat tempo, and I managed to put the momentum back in my favor, which was pivotal in winning the match." Both players held serve in the next five games, and Millman served for the championship at 5-3. Then it got dramatic. Millman fell behind 0-40 on Krajicek's run-around forehand passing shot after the longest rally of the match, eliciting a roar from the pro-American crowd of about 400 fans at the 1,200-seat Center Court. That gave Krajicek three break points to get back on serve at 4-5, but Millman reeled off five straight points for the title. "That last game, I'd prefer to win it a little bit easier," said Millman, who had only one ace in the match but only one double fault. "But I'm proud of myself for coming back from 0-40 serving for the match and winning the next five straight is pretty special." Millman said he gets his mental toughness from his parents, Ron and Shona. "My mum and dad are probably the strongest people I know, in terms of what they've sacrificed for their family. They worked four of five jobs between them to get my (four) sisters and myself through private education. "You learn a few things about sacrifice and working hard from those types of people. It was a real treat to have them come over and watch me play Wimbledon, and I think they'll be at the U.S. Open now." Top-seeded Guccione of Australia and Artem Sitak, a Russia native who plays for New Zealand, won the doubles title with a 6-4, 7-6 (2) victory over unseeded Yuki Bhambri of India and Matthew Ebden of Australia. The Comerica Challenger was the first tournament together for players on each team. It was Guccione's fifth Comerica title, four in doubles and one in singles. The 6-foot-7 (2.01-meter) left-hander won three straight doubles crowns with countryman Carsten Ball (2009-11) and captured the 2009 singles title. Guccione and Sitak split $6,200; Bhambri and Ebden shared $3,600. Ebden won the 2013 Australian Open mixed doubles title with Jarmila Gajdosova, who played for the Sacramento-based California Dream of World TeamTennis last month. John Millman and Austin Krajicek have extra motivation today in the final of the $100,000 Comerica Bank Challenger in Aptos, Calif.
Millman, a 26-year-old Australian, can win his second straight Challenger and become the first No. 1 seed in the 28-year history of the Aptos tournament to win the title. The seventh-seeded Krajicek, a 25-year-old left-hander from Bradenton, Fla., can earn a wild card into the upcoming U.S. Open and continue the Aptos streak. Millman, who won the $50,000 Lexington (Ky.) Challenger two weeks ago, outlasted third-seeded Kyle Edmund of Great Britain 3-6, 6-4, 7-5 Saturday at the Seascape Sports Club. It was the first time Millman has lost a set in the tournament. Krajicek beat countryman and good friend Bjorn Fratangelo, seeded fourth, 6-3, 7-6 (2) after knocking out second-seeded Malek Jaziri of Tunisia in the quarterfinals. Krajicek is 1-0 against Millman, having won 6-2, 6-4 in May 2014 on a hardcourt in the first round of the Busan (South Korea) Challenger. But Millman had recently returned from shoulder surgery. Millman already is ranked high enough at No. 85 to earn his first berth in the main draw of the U.S. Open, Aug. 31-Sept. 13 in Flushing Meadows, N.Y. The 132nd-ranked Krajicek, though, much receive a wild card or qualify. Fratangelo leads the U.S. Open Wild Card Challenge with only Aptos remaining, but Krajicek can finish first with a victory today. The American who fares the best in two of three designated summer tournaments, including $50,000 Binghamton (N.Y.) and Lexington, will receive a wild card into the singles main draw of the U.S. Open. If Krajicek loses to Millman, Fratangelo will get the wild card. Krajicek has never played in the singles main draw of the U.S. Open but has competed in the main draw of doubles three times, reaching the second round in 2013 with countryman Denis Kudla. Krajicek is a distant relative of 1996 Wimbledon champion Richard Krajicek of the Netherlands. At Seascape Sports Club in Aptos, Calif.
Austin Krajicek (7), United States, def. Bjorn Fratangelo (4), United States, 6-3, 7-6 (2). John Millman (1), Australia, def. Kyle Edmund (3), Great Britain, 6-3, 4-6, 7-5. Chris Guccione, Australia, and Artem Sitak (1), New Zealand, def. Karen Khachanov, Russia, and Elias Ymer, Sweden, 7-5, 6-7 (3), 10-4. Yuki Bhambri, India, and Matthew Ebden, Australia, def. Austin Krajicek and Nicholas Monroe (2), United States, 5-7, 6-4, 10-8. Chris Guccione, Australia, and Artem Sitak (1), New Zealand, vs. Yuki Bhambri, India, and Matthew Ebden, Australia. John Millman (1), Australia, vs. Austin Krajicek (7), United States.